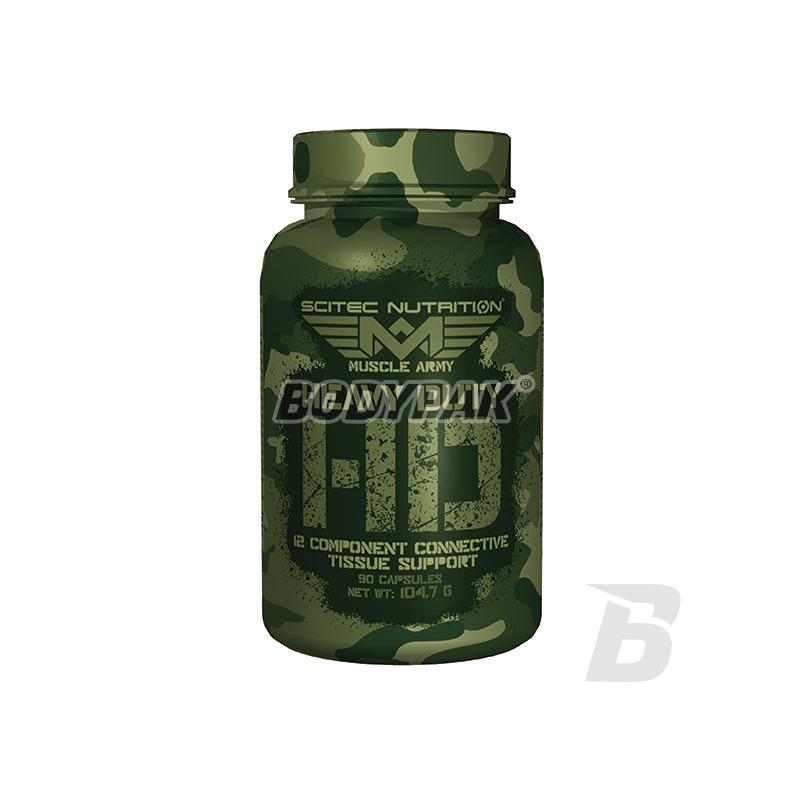 Joint HealthScitec Muscle Army Heavy Duty - 90 kaps. The best supplement on the market that supports regeneration of joints and ligaments. A thoughtful and rich set of active substances additionally enriched with plant extracts! Enough to last 44 days of supplementation! FLEXIT drink protects, nourishes and regenerates tissue - joints, joint capsules, cartilage, tendons, ligaments and bone tissue. Scitec Muscle Army Heavy Duty - 90 kaps. The product supports regeneration and health of your motion system, which is often strain during strenuous workouts! 108 loyalty points Your cart will total 108 points that can be converted into a voucher of 4,32 PLN. 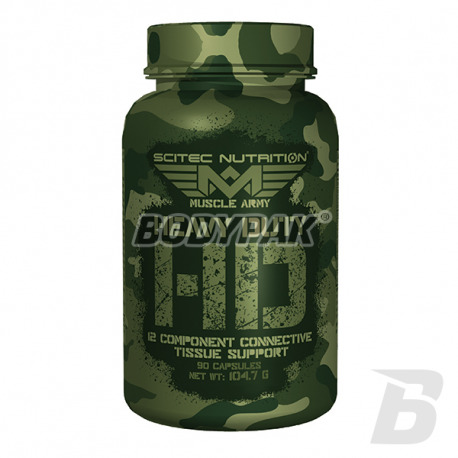 Scitec HEAVY DUTY is a complicated formula based on 12 special ingredients that is used to support the connective tissue. Among the ingredients is also a formula NEM® (natural eggshell membrane) - a patented formula, which is also used to manufacture the products HEAVY DUTY. In addition, these products also contain more preferably of type II collagen and hyaluronic acid! In addition, HEAVY DUTY provides a popular glucosamine, chondroitin and MSM. Included in the HEAVY DUTY 100% of the recommended daily intake of vitamin D improves the functioning of the immune system and muscles, it helps to maintain healthy bones and teeth and helps the absorption of calcium and phosphorus *. * Statements have been scientifically proven and approved by the European Food Safety Authority (the European Food Safety Authority). Składniki: Siarczan glukozaminy 2KCl (pozyskany ze skorupiaków), Siarczan chondroityny, żelatyna wołowa, Hydrolizowana chrząstka kurczaka w proszku (52% Hydrolizowany kolagen typu II z mostka kurczaka), Metylosulfonylometan (MSM), Nośniki (Celuloza mikrokrystalyczna, Stearynian magnezu), NEM® Natural Eggshell Membrane (naturalna błona skorupki jaja), kwas askorbinowy, kwas hialuronowy, Bromelaina, ekstrakt z kłączy Curcuma longa Linn. (95^ kurkuminoidów), Siarczan cynku, cholekalcyferol, Siarczan manganu monohydrat. 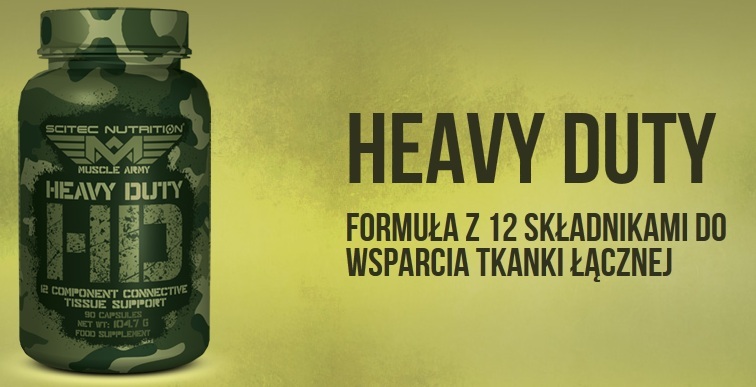 Cała seria produktów Muscle Army z Scitec'a jest w mojej ocenie godna uwagi. Ich produkty oceniam bardzo wysoko, natomiast jeśli chodzi o sam produkt Heavy Duty to ból w stawach w końcu minął, nic nie chrupie, nic nie boli! Polecam spróbować, bo wart jest tych pieniędzy ! Działa na 100% . Polecam zażywałem na ból stawów, głownie kolan. Efekt wyczuwalny już w połowie stosowania. Nie stosuje już ok 2tyg bo się skończyło ale jeszcze nie wypłukałem nadal działa. POLECAM mogło być trochę tańsze. BioTech Arthro Guard - 120 tabl. OLIMP Glucosamine is a preparation containing glucosamine sulfate and vitamin C, substances necessary for the proper construction of cartilage tissue - joint.